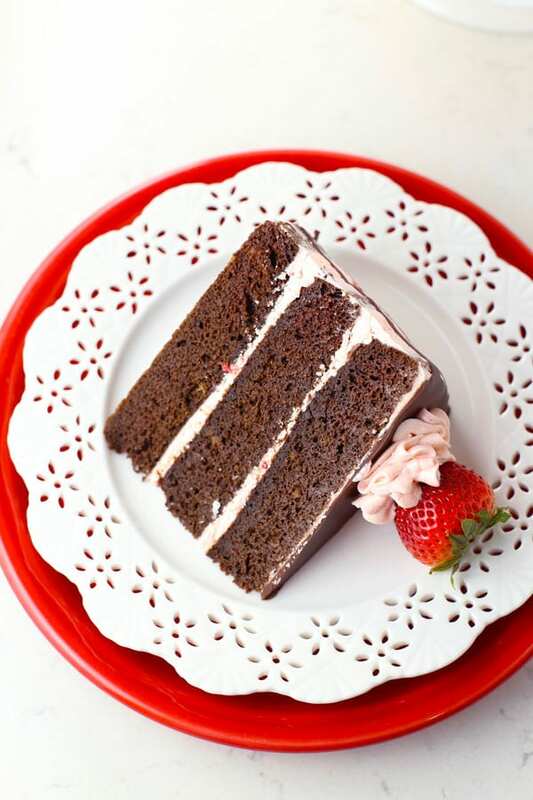 Sugar Free Gluten Free Chocolate Strawberry Cake is the perfect treat if you have food allergies or are watching your waistline. You know I love real sugar just as much as the next guy, but let’s face it. It’s not good to eat it every day. I truly like to save the decadent desserts for special occasions and believe it or not, I’m on a perpetual diet. That’s the truth! 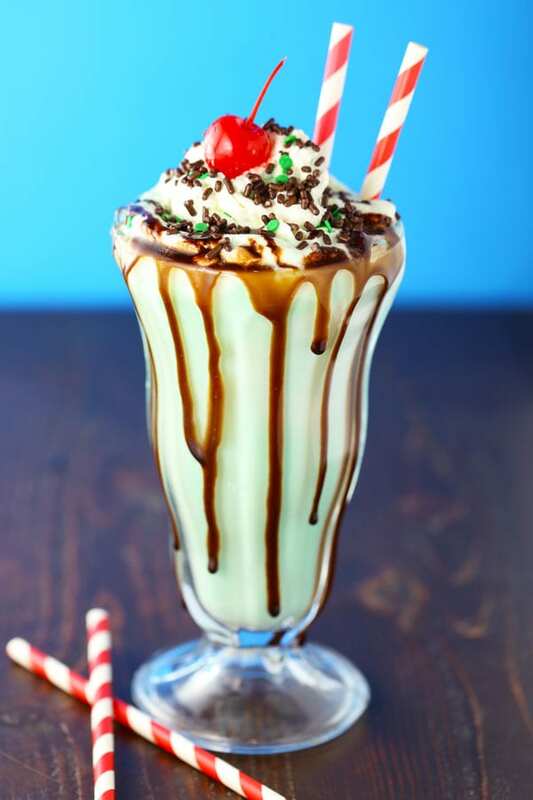 So what is a dessert lovin’ girl supposed to do? I’ve been experimenting with all natural, sugar free sweeteners for several years now and I’ve learned to love them. I say “learned” to love them because they are definitely different from real sugar. But they can be quite nice once you’re used to them. 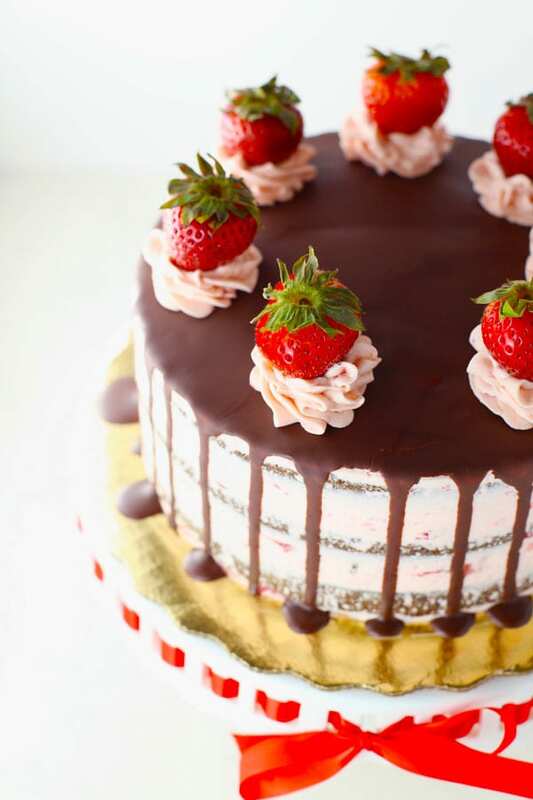 I created this pretty Sugar Free Gluten Free Chocolate Strawberry Cake recipe especially for a brand called Lakanto. They make a variety of sweeteners using Monk fruit and they taste very good. These are the Lakanto products that I used for this recipe. And I have a special offer to share with my readers – 20% off if you click this link to make your purchase. 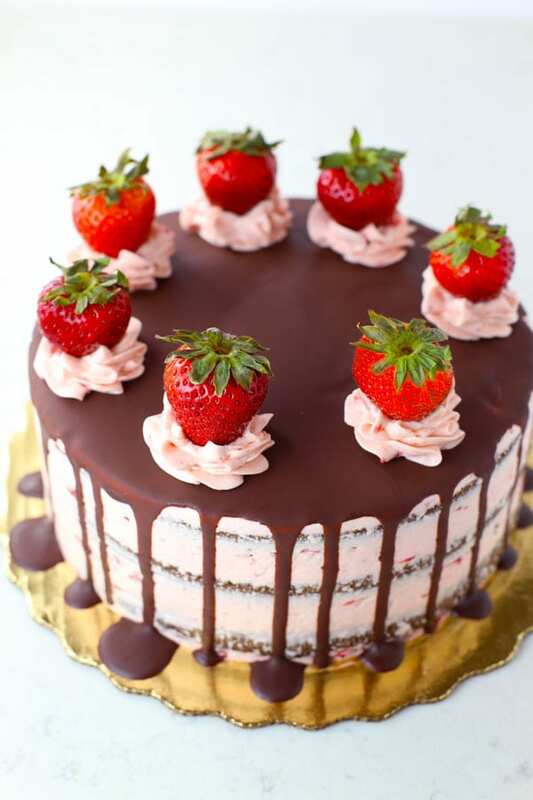 Then enter this code – MOMLOVESBAKING – to get your 20% discount. Making this cake is quite simple. Just place all of the cake ingredients in a big bowl and stir until the batter is smooth. You can use an electric mixer if you want to. Pour the batter into 3 (8-inch) round cake pans lined with parchment paper and sprayed generously with cooking spray. Bake at 350°F for about 25 minutes. Let cool. 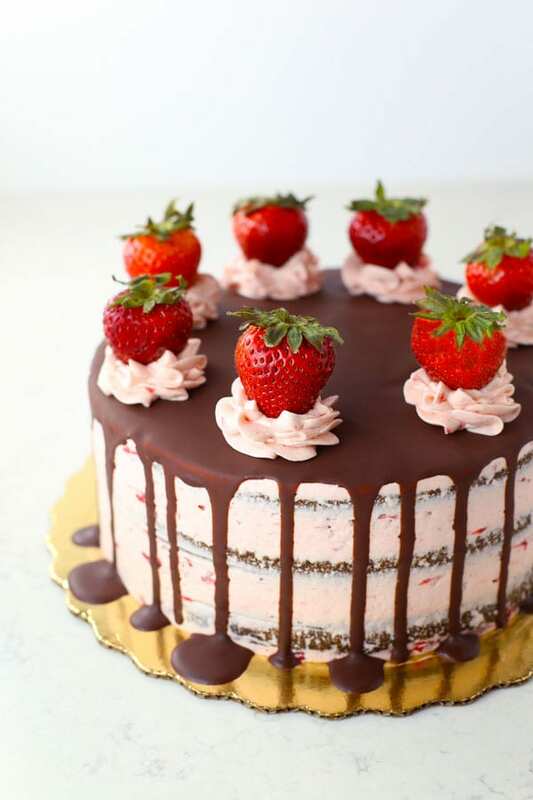 Meanwhile, make the strawberry buttercream frosting. Beat two sticks of unsalted (room temperature) butter until fluffy. Add the powdered monk fruit sweetener and 1/2 cup of strawberry puree. Beat on low until incorporated, then turn the mixer up to medium and beat about one minute. That’s it! 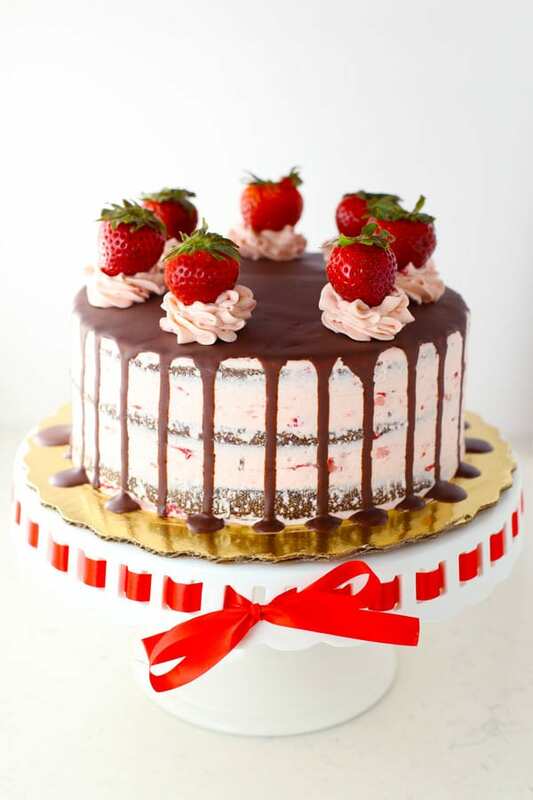 Your strawberry buttercream is done. Fill and frost the cake (reserving about 3/4 cup of frosting for garnish). You’ll have enough frosting for a thin layer of icing, sort of like a naked cake. Refrigerate cake for 30 minutes (if time – I actually skipped this step). Then you make your ganache. I like to keep it simple, so I just microwaved the sugar free chocolate (broken up into pieces) in a microwave safe bowl on high for 30 seconds. Then I stirred well and added a tablespoon of olive oil which I stirred until combined. If you need to microwave it for another 15 seconds, that’s perfectly fine. You just want it to be nice and soupy, so you can drizzle it on top of your cake. Refrigerate for about an hour, then garnish with more buttercream (piped using a pastry bag fitted with a 1M tip) and fresh strawberries. 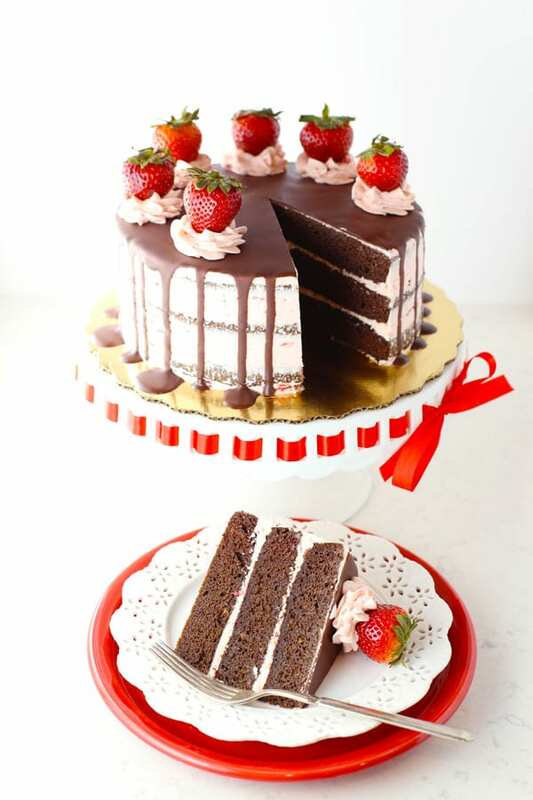 This Sugar Free Gluten Free Chocolate Strawberry Cake is not super sweet but it’s just enough sweetness to satisfy that sweet tooth when you’re counting calories or if you have food allergies. If you want it a little sweeter, you could use half sugar free sweetner and half real sugar. I tried that too and it was very good. More calories of course though. If you make it as the recipe is written, then it’s just 240 calories per slice (if you cut 16 slices of cake). 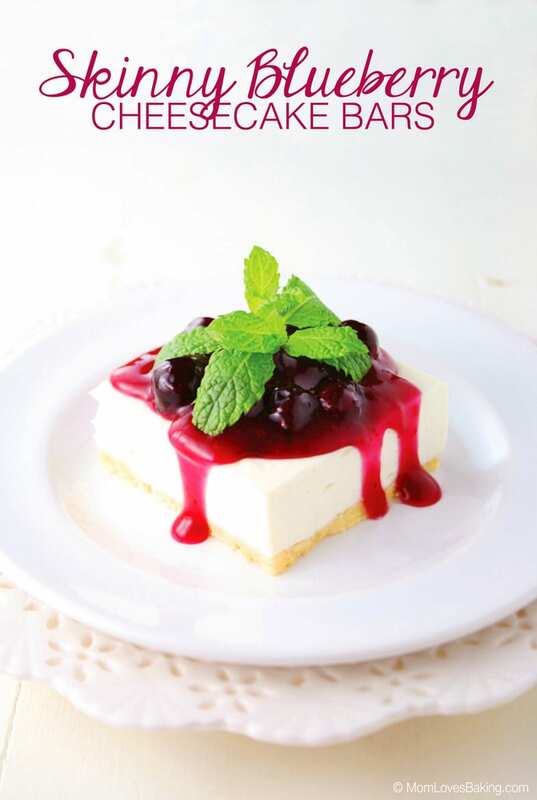 Have you every baked with sugar free sweetners? I’d love to hear your stories. Let me know in the comments and also let me know if you try this recipe. Be sure to take a photo and tag me on Instagram #momlovesbaking! Please note: This blog post contains affiliate links. 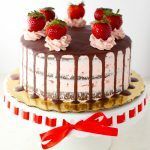 Four layers of moist, gluten free chocolate cake filled and frosted with strawberry buttercream, then drizzled with chocolate ganache. All ingredients are sugar free. 1 2/3 cup maple flavored sugar free syrup by Lakanto I used the whole bottle. Preheat oven to 350°F. Line 3 (8-inch) round pans with parchment paper. Spray with non-stick cooking spray. Set aside. Place all of the cake ingredients in a large bowl. Beat by hand until completely combined and smooth. Or you can use an electric mixer. Beat on low until combined, then turn up to medium and beat for a minute or until smooth. Do not overmix. Divide batter evenly into the 3 prepared pans. Bake for 25 minutes or until a toothpick inserted in the middle comes out clean. Let cool. Place butter in a large bowl. With an electric mixer, beat on high for a few minutes. Lower speed and gradually add the powdered monkfruit. Turn up mixer and beat until smooth and fluffy. Gradually add strawberry puree and beat another minute or two. Fill and frost cake (reserving about 3/4 cup of frosting for decoration). Place in refrigerator and let chill for 30 minutes. Place chocolate in a medium sized microwaveable bowl. Microwave on high for 15 seconds. Stir well, then microwave for another 5-10 seconds. Stir until smooth. Add oil and stir well. Drizzle on sides of cake with a spoon , then pour on top of cake and smooth it out. Chill for 1-2 hours. Place reserved icing in a pastry bag fitted with a 1M tip. Pipe 7-8 dollops of frosting on top of cake, then add a fresh strawberry. Serve immediately or store in refrigerator for up to 3 days. 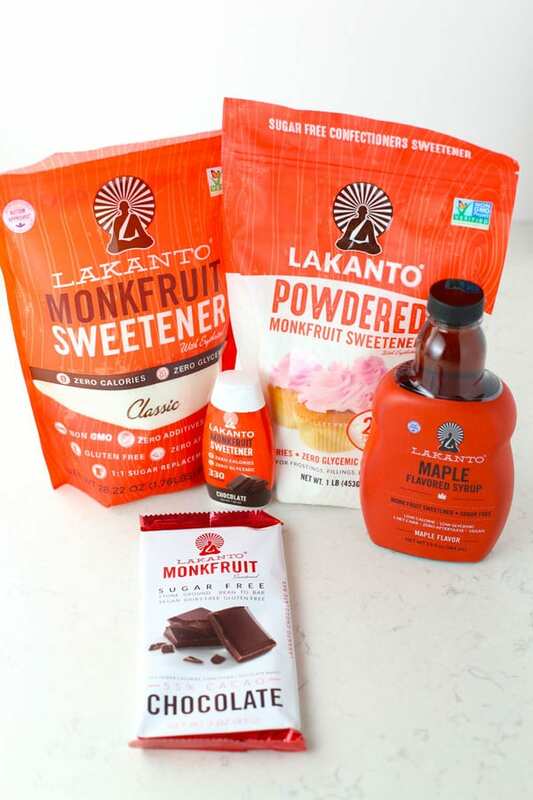 These are the Lakanto products that I used for this recipe. And I have a special offer to share with my readers – 20% off if you click this link: https://www.lakanto.com/?aff=85 to make your purchase. 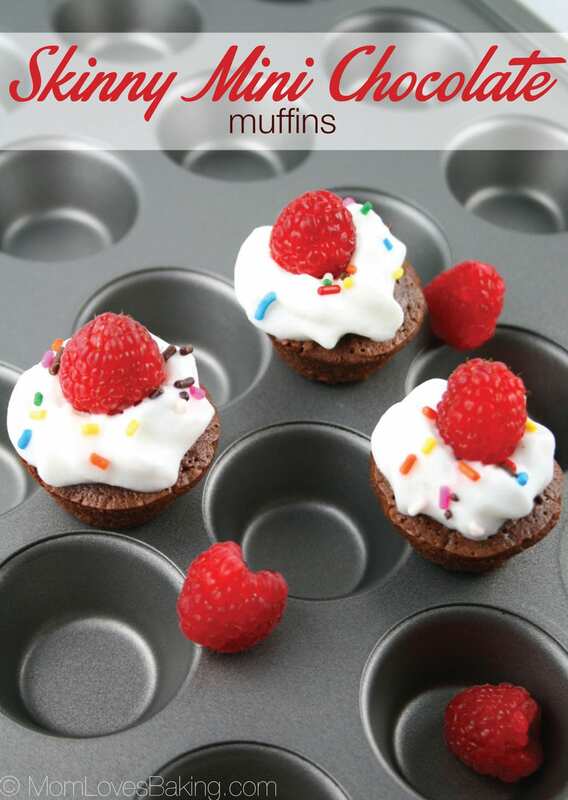 Then enter this code – MOMLOVESBAKING – to get your 20% discount. Gorgeous! This is a work of art!